The harmonica is a free reed wood-wind instrument. Harmonicas have an incredibly rich range of expression, are easy to pick up, since there's no need for fingerings, etc. They play numerous "intervals" (two or more notes), which is difficult or impossible for many other wind instruments. It also works very well in the modern musical setting, where one needs to play most music through an amplifier or loudspeaker. A harmonica player can easily adapt to this by cupping a microphone and his or her harmonica in the hands, without sacrificing any other aspect of playing. 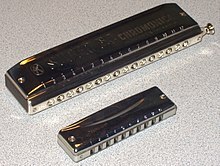 Harmonicas are extremely important for Blues music - in order to acquire its unique, soulful sound, a harmonica is needed. Harmonicas cross many genres - the diatonic harmonica is frequently used for rock, country, folk music and Irish jigs; and the chromatic harmonica is often associated with Jazz music, and more recently, Classical music. The tremolo harmonica is often used for Japanese folk songs. The harmonica is also a very portable instrument. They can fit easily into any reasonably sized jacket pocket, which is very rare for all instruments. Furthermore, learning the harmonica can improve your breathing, and thus, your health. The constant breathing into and out of a harmonica is substantial exercise for the diaphragm, which is why harmonicas are sometimes used to improve breathing. Harmonica Purchasing guide - Types of harmonica, and how to buy harmonica and its relevant materials. This page was last edited on 26 August 2018, at 16:10.